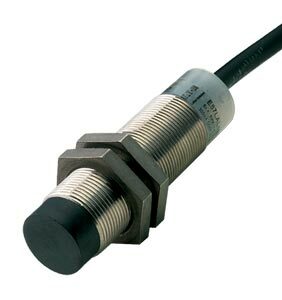 The Cutler-Hammer® Premium+ Series inductive proximity sensors have improved sensing performance, product durability and selection. This improved line of sensors carries the Premium+ Series name because we have upgraded the design to a rugged stainless steel body, shock resistant front caps and impact absorbing potting compound. Also, the Premium+ Series line now includes a choice of AC/DC and DC-only, 12, 18 and 30 mm sensors with unmatched noise immunity of greater than 20V/meter. 1 For cable lengths longer than 2m (6'), add the number of the desired length in meters to the end of the listed model number (for model numbers ending with a number, add an "S" and then the length). Example for a 5 m cable: E57LAL12A2 becomes E57LAL12A2S5. 2 Avoid wiring these AC/DC models in series as the sensors may not perform reliably. Contact OMEGA’s Applications Engineering with questions.